Steve Adubato, PhD. Writer, former visiting professor at New York University, Rutgers University, Seton Hall University and the New Jersey Institute of Technology. “I have outlined what the rest of us, regardless of our professional status or field, can take away from the leadership mistakes of others. (For example) how President John F Kennedy got it terribly wrong as a leader in the Bay of Pigs fiasco in Cuba in 1961 but, fortunately, got it right in the Cuban Missile Crisis less than one year later. 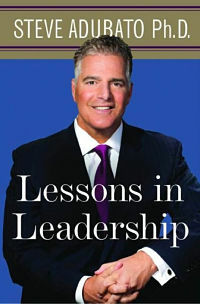 Find the book here: Lessons in leadership.